Don't miss the other designs that use these sleds! Visit Lizzie*Kate Snippets, Shepherd's Bush and Sue Hillis Designs to see them. 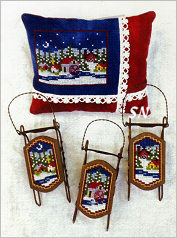 Some cute new mini-sled and sleigh designs by Foxwood Crossings... we may be entering Spring... but if you get these now, you MIGHT have them stitched by next Winter!!! 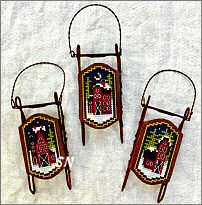 SUPER-CUTE and really popular, this is a line of miniature 3, 4 and 7-inch wooden sled ornaments. These are new charts to decorate them! All the wooden pieces are available separately, and we do offer a Baker's Dozen Special on them!!! 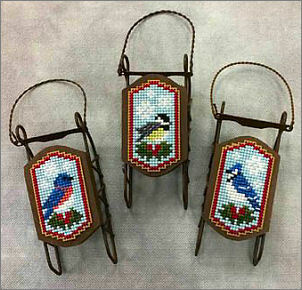 Backyard Visitors features three birds -- stitched on 14/28ct or 14ct perforated paper, they are only 17 x 31 in stitch count -- 1 x 2. 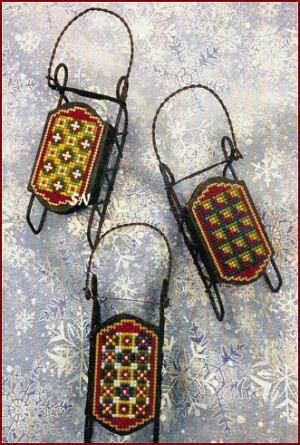 Painting your little sleds is an option -- think about red for these! Rudolph Flight School's chart features designs for ALL THREE different sizes of the sleds and sleighs. You can really see the size difference on the pic -- the mini (the most popular) is the bitty one at the bottom in the center. 4-Inch version on the right, 7-inch on the left. 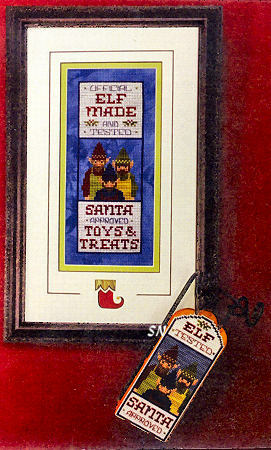 The framed piece is basically the same design featured on the largest sleigh. Charted for DMC floss with options for a little hand-dyed and metallics, they are all festive for your Christmas Tree, wreaths and decorations. 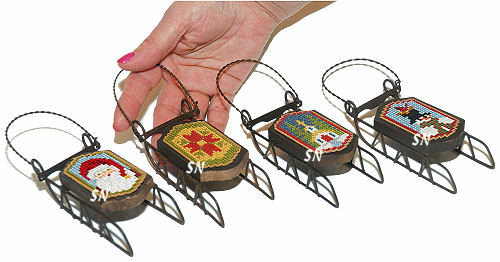 Oh gosh, everybody LOVES these little sled ornaments! Tiny 2-inch wooden sleds, each has a bed that is perfect for a bit of Cross Stitch! Foxwood Crossings has tons of designs, and here 7 more! 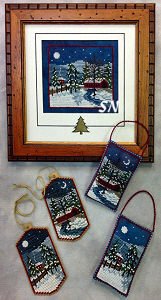 Snowy Barns and Snowy Visitors -- each takes a jiff to stitch on 14ct perforated paper or 14/28 fabric. 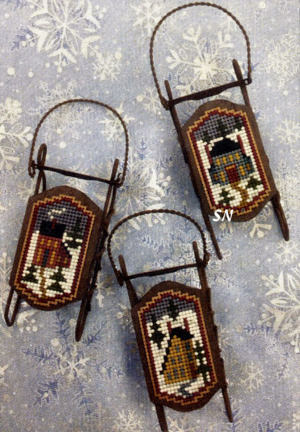 You can paint your sleds, put ribbons or greenery on them... get as creative as you want, but know they are DARLING just they way they are -- left brown. We have a Bakers Dozen on the mini wooden sleds. 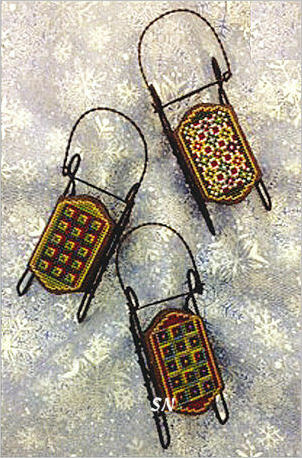 Foxwood Crossings has two new mini-sled patterns. Officially there are now a TON of cute offerings for the small wooden mini-sleds that are perfect a Christmas Tree ornaments and small decorations. 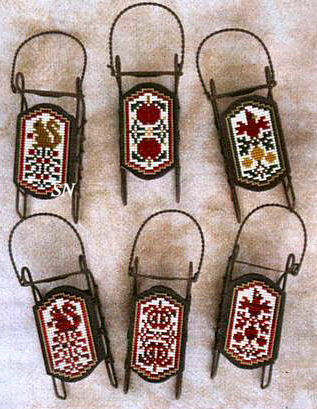 There are three sizes of sleds, and several of the patterns have designs to fit more than one size. The smallest size is cute on a tree or wreath, the medium ones still work on a wreath, and the larger ones make awesome table decorations. 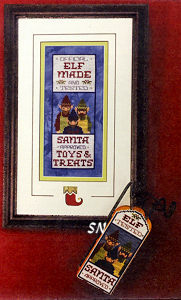 North Pole features Santa, Elf Made features his ever-important Work Staff! Along with Foxwood's sled designs, you might like those from Sue Hillis, Shepherd's Bush or Lizzie*Kate as well! 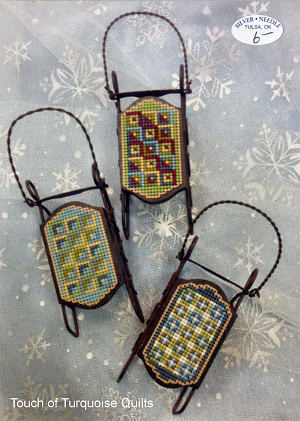 New Charts for your Mini Sleds and Sleighs! 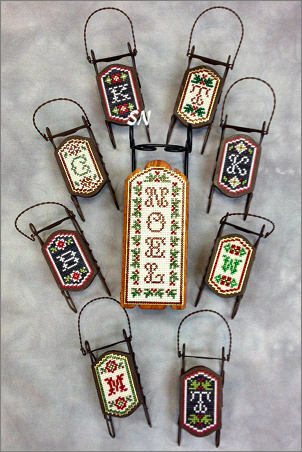 Wow... more charming designs to decorate Foxwood Crossings unique miniature wooden sleds and sleighs! 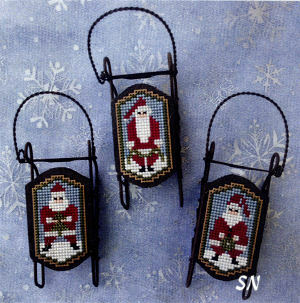 Three new chart designs in all -- they are stitched on 14ct perforated paper (fabric will work too) and then simply glued to the larger 7-inch sleighs and medium 4-inch sleds. Framing is an option as well... really changes their appearance!!!!!! Cindy has charted each of these 4 ways -- for the wooden pieces, pin cushions, ornaments or framing. 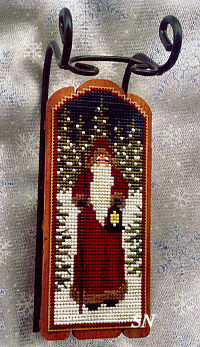 Morning Star Santa -- Very Olde Worlde, Santa in the snowy woods... you could add metallic to the stars and opalescent to the snow... and wool for the squirrel or the fur on his coat! River Road Church -- Again, very traditional, this one would look really cool with silver blending filament in the shadows and opal in the snow. 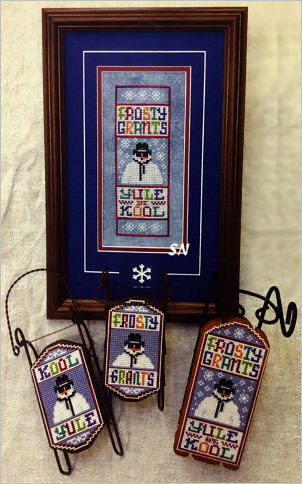 Frosty Grants -- Quite the Kool Man... this is definitely a turn from the other designs... but so fun especially if you are stitching annual ornaments for a growing young man! 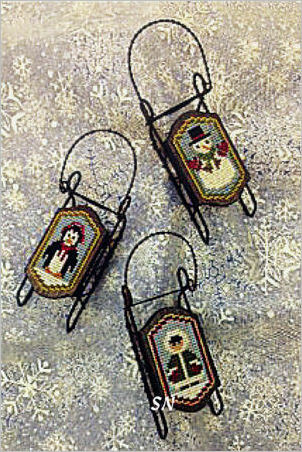 Foxwood Crossings continues her collection of patterns for her delightful miniature wooden sled ornaments. I think there are around 100 different small designs for them, this small chart offers a nativity theme. Stitch count is a mere 17 x 31 -- and because they are worked on 14ct perforated paper -- they finish only about an inch by 2. 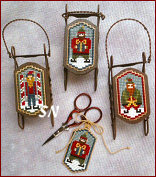 You just cut out the final shape on the paper one row from your stitching and glue it onto the sled. THAT'S IT! 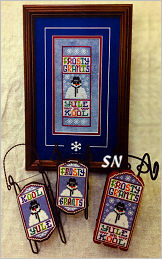 ***Super Cute***, take advantage of that Baker's Dozen on the sleds, and stitch away! VERY cute attached to a greenery garland that is draped around a doorway, too. They make fun place cards at the table, and maybe YOUR Santa will fold a dollar bill and tuck it onto the backside. 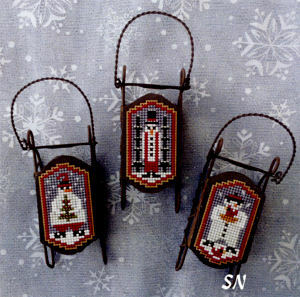 Advent Calendars don't have to be flat, either... stitch the date numbers on these and hide the 'gift' on the backside, or just a bitty motif on them, with the date, and tie them to a wreath! They are darling painted, too... Lizzie Kate did her Sled Dudes in Aqua! Click to see the whole collection! 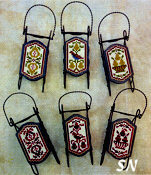 New From Foxwood Crossings -- A Mini Village for Mini Sleds AND NEW Medium-Sized Sleds!!! We had hoped Foxwood would be able to get her itty-bitty sleds in just a bit of a larger size... and they are HERE! 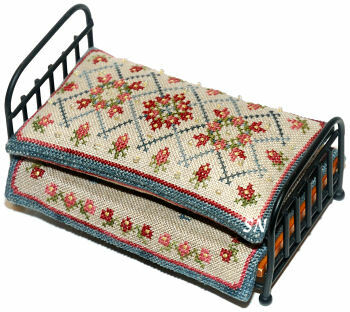 Mini-Sled -- Stitching area is 1-1/2 x 2-1/2. Overall length is 5 inches including handle. Medium Sled -- Stitching area is 2-1/4 x 4. Overall length is 8 inches including handle. Sleigh -- Stitching Area is 2-1/2 x 5-1/2. Overall length is 7 inches long. 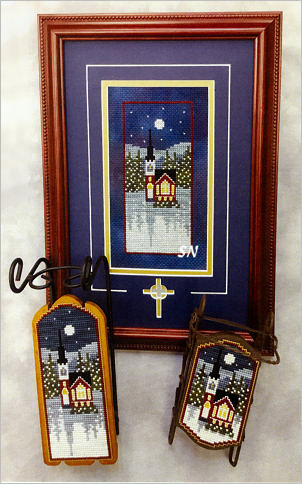 Foxwood Crossings has two new larger charts that feature a main design along with smaller ornament sized pieces to match the larger one! 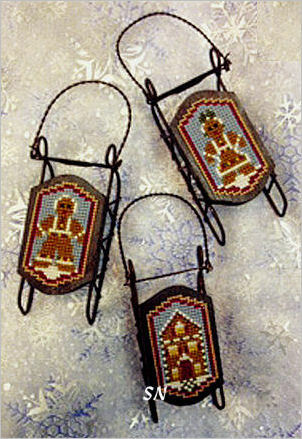 You'll notice the pair of tags in each picture -- they are the SHAPE of her smaller sleds, but a pinch larger. We have *SOME* slightly larger sleds in the shop -- and trying to get more -- so we'll let you know if there will be sleds to mount those onto. 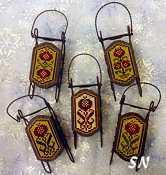 Otherwise, they make pretty ornaments stitched on perforated paper -- just the way they are! Harrisburg Winter has been here for a few weeks -- A lovely winter scene stitched on Navy -- fabric counts or perforated paper depend on your eyesight!!! All of the smaller ornaments are simply bits and areas stitched out of the main picture! 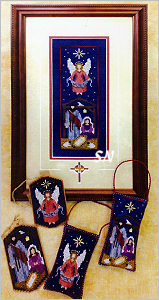 First Noel -- A classic Nativity scene, this is again, stitched on Navy. We have 14 Aida, 14ct Navy Perforated Paper and 28ct Navy Linen. The paper is the easiest to see on... the linen is very difficult. Coded for DMC or hand-dyed flosses, there is gold metallic in the star. Very pretty, this is another chart that we MIGHT get the larger mini-sleds for! (stay tuned!) Either way, just like Harrisburg Winter, every bit of this design looks good as small ornaments or the larger main piece. 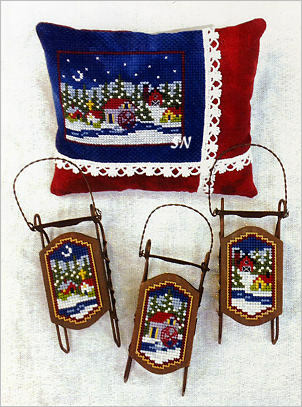 Foxwood Crossings has two new sets of designs to fit their bitty wooden sled ornaments! Some tiny quilt block motifs, each stitched area measures a mere 17 x 31 in stitch count. Usually worked on 14ct perforated paper to make your finishing super-easy, all you do is cut around your needlework and glue (it's ok!) them onto the tiny sleds. Designs come three to the set -- as pictured. Sleds are offered separately, and we have a Baker's Dozen Special on those as well! A fun variety of releases... not just sleds this time around!!! 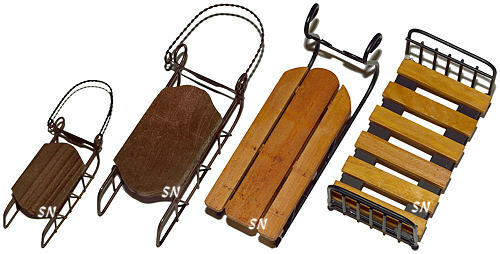 Letter Sleds A to Z -- More miniature wooden sled designs -- you have options with this! 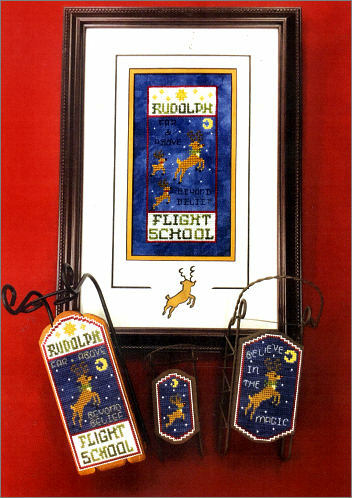 Presented as a chart, you get the large 31 x 75 sleigh design, along with 4 smaller master-borders and two different alphabets to personalize your 17 x 31 bitty ornaments. Cindy is using gold metallic and dark red perforated papers this time... but the traditional brown still works just as well. So, choose your border, choose your initial, and even the background colors. 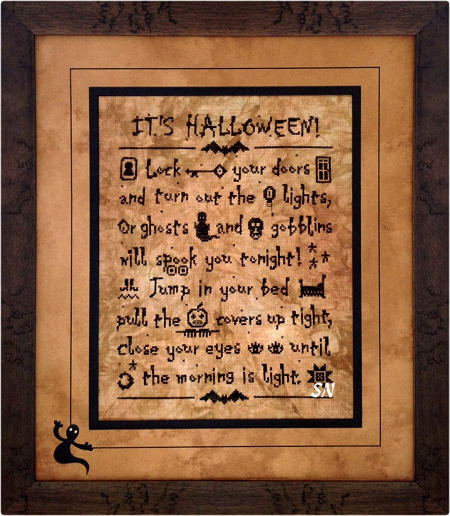 It's Halloween -- I love the verse on this! *Lock your doors and turn out the lights, or ghosts and goblins will spook you tonight! Jump in your bed, pull the covers up tight, close your eyes until the morning is light! * She's scattered the cutest bitty motifs throughout the verse -- the little lock, bed, lightbulb, bed and even your feet -- that you'll need to jump into bed with! 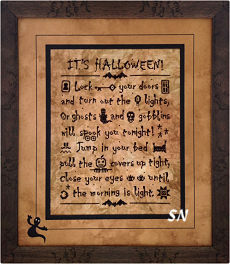 Stitched on 28ct Cyprium Cashel Linen by Picture This Plus... lots of bright Halloween colors of material will do, if you have something fun already -- you'll need only 3 skeins of Weeks Onyx hand-dyed floss to stitch this chart. Foxwood Crossings mini sleds are back in stock!!! (We think they spent the Holidays in those delayed containers on the west coast...) Oh, we've missed these little guys!!! 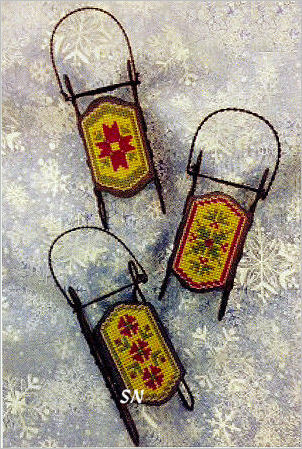 Darling miniature wooden sleds, each measures less than 2 x 3, they have wire runners and a little handle, cute to paint, they make darling Christmas Ornaments. 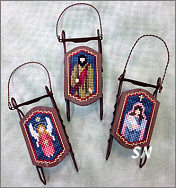 They are all decorated with your stitching -- the entire bed area is only 17 x 31 stitches. Foxwood's designs all use 14ct perforated paper for them -- which makes them even easier and quicker to finish! 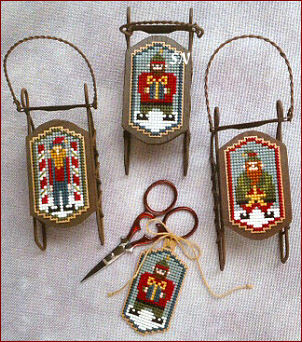 Elf Folk is the newest bitty sled design... it features a trio of woodsy guys who'll look cute with all the rest of Foxwood's growing collection of 55-ish bitty sleds!!! It is offered as a small chart. 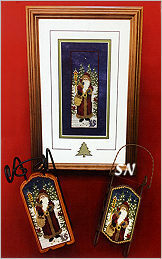 Here are two more designs to fit your Foxwood 7-inch sleighs... but you can frame them... if you're not 'into' a sleigh-ride!!! 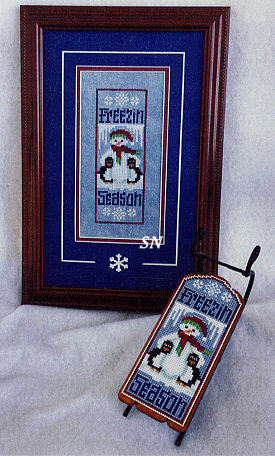 Offered as charts, each design is only 30 x 75 stitches and can be worked on fabric or perf paper. 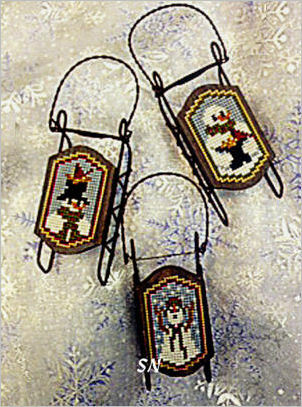 The little wooden and wire sleighs shown are real cute. I think these are too large to be ornaments, but perfect as wreath decorations or little sit-abouts. 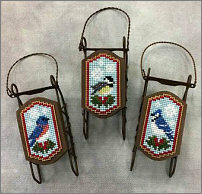 A new trio of smalls for these, here is a cute squirrel, apples, and a fun bird caught nibbling some berries. Offered in small chart format just like all the rest of the sled patterns, VERY quick to work up! Oh.... It's Looking Like Christmas in July! 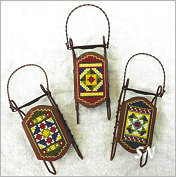 Foxwood Creations has three new offerings of tiny sled topper designs... and they arrived this past week. 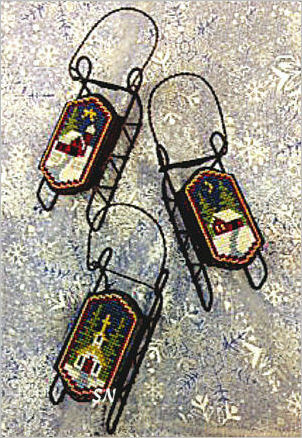 If you haven't 'discovered' our miniature wooden sled ornaments yet, they are DARLING! 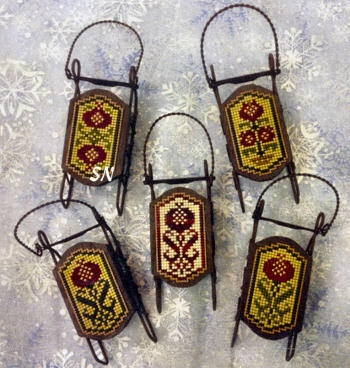 Small 2 x 3-ish inch brown wooden sleds with twisted wire runners and leads, you stitch the tops of them with a TINY bit of 14ct perforated paper or a bit of fabric. Foxwood has approx 36 different designs to top them, and now Pear Sleds, Snow Folk and Santa Folk join the lot! You can dress up your sleds with ribbons or even paint them another color... if you are super creative, you could even use them as bases for pom-pom ball snowmen... they are a cute craft item. A sheet of 9 x 12 brown perforated paper (they come two sheets to a pack) will do more than a dozen of these! 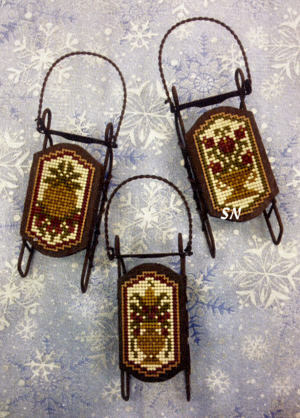 Another new set of three designs to fit our tiny Foxwood Crossings Sleds... Pomegranates symbolize abundance, prosperity and hope for eternal life... all good sentiments to adorn your Christmas Tree! This is a small chart with the three designs and some suggestions for color changes. 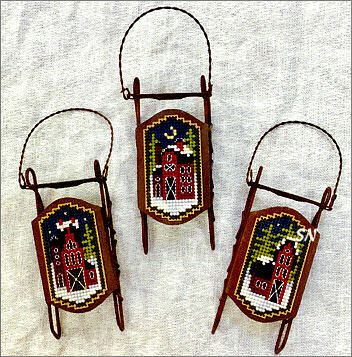 Winter is STILL hanging on... so Foxwood has sent three new designs to help you decorate all her miniature sled ornaments! Super-popular this past Christmas... the Foxwood Sleds are 2 x 4 wooden and metal pieces that feature a tiny 'bed' for stitching. With design areas of 17 x 31 on 14ct perforated paper (that means your stitching is only 1 x 2 inches! 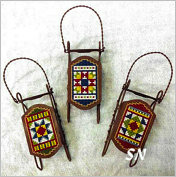 ), these are a very quick-stitch. Christmas is only 10 months away!!! Do your quick stitching, trim the paper to fit the sled, back it with a bit of felt or pretty paper if you want... and glue it onto the sled! 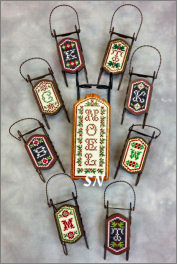 Each wood and metal sled ornament is nicely made -- not all bent up or rough. The little runners are 4 inches long, the swing handle is another 2. 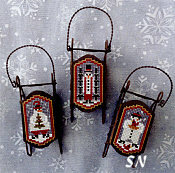 They stand an inch high, and the stitch area is just a mere 1-1/2 x 2-1/2. So, So CUTE!!!!!!! 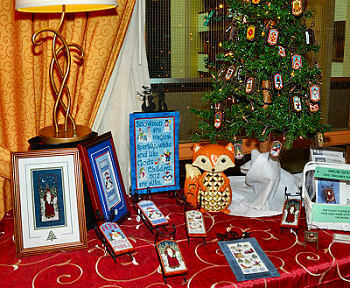 Talk about different, quick and CHARMING tree ornaments! Offered as the 7 small card charts, the sleds are available separately, and if you are careful a perf paper sheet will do 18 of these! BE CAREFUL TO ORDER ENOUGH SLEDS FOR ALL YOUR ORNAMENTS! 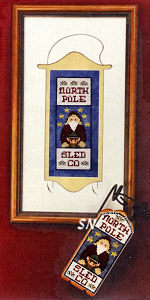 Sled Heads features Santa, Mrs Santa and Rudolph. Snow Grateful has a trio of snowmen. Snow Friends has a penguin and an Eskimo, and another snowman. 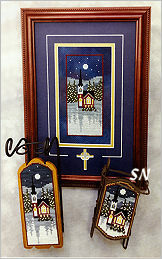 Snow Country Sleds features a church, barn and cabin in the woods. Bread Sleds has a gingerbread couple and tiny gingerbread house! (love that name!) 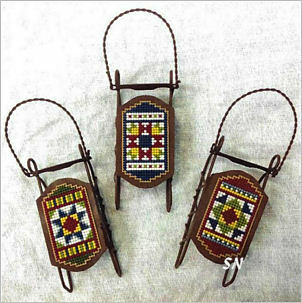 Mixed Bag Quilts has three tiny quilt block patterns. 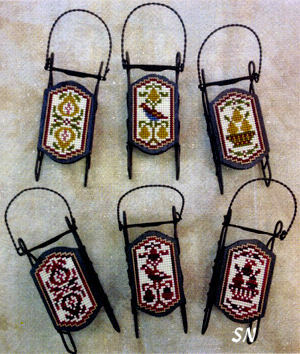 Quaker Sleds features three tiny Quaker motifs. More darling ornaments!!!! 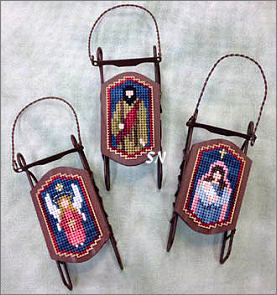 On the larger side, Foxwood Crossing has two more designs that fit a sleigh that measures 7 x 3 (the metal) with a bed that is 1-1/2 inches high and measures 2-1/2 x 5-1/2. Acme Snow Mobile is so cute and retro... while RFD Sledding is a traditional country snow play scene. 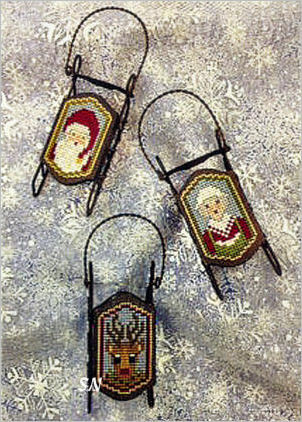 Both are shown stitched on 14ct perforated paper, trimmed and mounted to the sleighs. 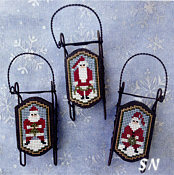 Each pattern is offered separately in chart format, so once again... order enough sleighs for your ornaments. Very nicely made, they are very sturdy, the wood is ok... and the black metal smoothly finished... there are even six little screws peeking out on the underneath side holding the planks in place. These would be cute as doll and candle perches, as well. A sheet of perforated paper should yield three of these, 4 if you space very carefully. OK... Another charming wood and metal piece... this one is a little bed measuring approx 5 1/2 inches long, 3 inches wide; 'mattress' is one inch high, the footboard is 2-1/2 inches -- the headboard is 3-inches. 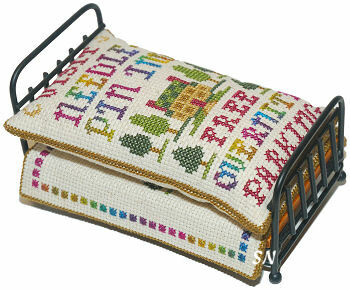 Foxwood Crossings has 2 different charts for these... Needle-Pin Inn includes a blanket poking out from beneath the topping pillow -- makes a darling pin cushion!!! The Floral Wreaths set is more reminiscent of a doll house set. You could use it as a pin cushion as well, you could make a pouch for scissors underneath the top... wouldn't these be pretty with tiny linen pillows trimmed with lace and antique buttons???? 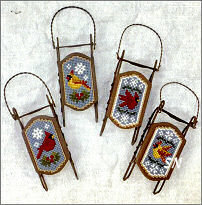 Charts are offered separately from the beds -- which, like the sleds and sleighs -- are very nicely made for their price! © 2019 Silver Needle Ltd.
You may not reproduce, copy, or redistribute the design or fonts layout of this web site, individual elements of the web site design, or Silver Needle images, designs, adaptations, charts, instructions or logos without the express written permission of Silver Needle, Ltd.